The Dana has all the makings of an awesome family friendly hotel – bay front location, two big pools, kid-friendly activities and inexpensive dining options. Yet what greeted me upon arrival at The Dana on Mission Bay was not excitement, but an unexpected surge of disappointment. Not that the destination wasn’t still great. There’s plenty to do and see to keep the kids happy for days. But the hotel I checked into was a far cry from the one represented on The Dana’s website, where I booked our stay. That’s because the Dana is comprised of an older section (built in the 1960s) and new one (build in the past decade). Had I realized this, we would have requested a room in one of the newer buildings, but there’s no hint that an older section of the resort even exists when you peruse the Dana’s website, which showcases modern rooms and sleek waterfront buildings. So needless to say, I felt a little duped when we were directed to an older building that looked nothing like what I was anticipating. That aside, the guest rooms were clean and functional, although 40+ years of updates and renovations still have the rooms being cooled and heated with loud wall units instead of central air. But big flat screen televisions and crisp bedding provided modern comforts. Although we upgraded to a marina view room, this part of the resort does not feature balconies, so the only time you can really enjoy the view is when you’re walking to and from your room along the external corridor. 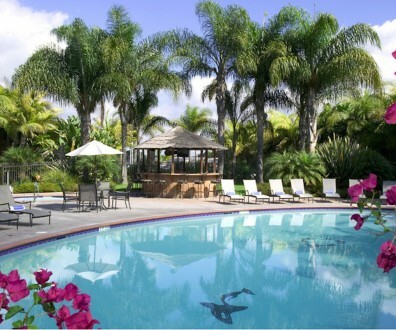 The Dana is located on San Diego‘s Mission Bay and features lushly landscaped tropical gardens. 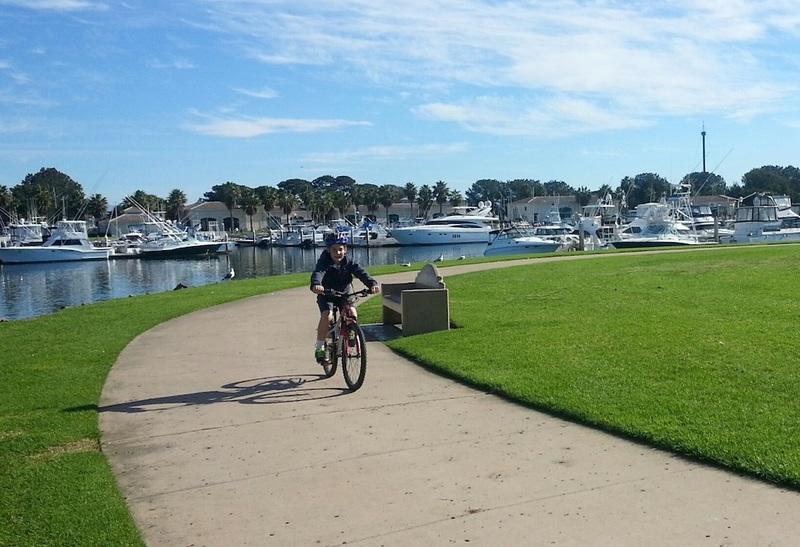 A beautiful, winding waterfront path is perfect for morning jogs or family bike rides. The resort features two outdoor pools and two whirlpools. One pool area overlooks the marina, while the other features a sandy play area for kids and shows movies on Saturday nights during the summer. Kayaks, pedal boats and bikes are available for rent. Complimentary ping pong makes a fun pit stop. Most rooms include refrigerators, coffee makers and microwave ovens. Pet friendly rooms allow you to bring the dog along for the trip. Less than one mile to Sea World – a doable walk or you can take the hotel’s free shuttle and save on parking. Small standard rooms and double beds instead of queens make for a tight squeeze. While close to SeaWorld and the beach, the Dana is a bit of drive to other popular San Diego attractions such as LEGOLAND, Seaport Village and the San Diego Zoo. Not-so-hidden mandatory fees – a $14 per night resort fee plus $20 per night for parking – can hike a reasonable room rate up rather quickly. What you get for the resort fee? “Free” wi-fi and a coupon book for the resort’s restaurants, store and amenities. 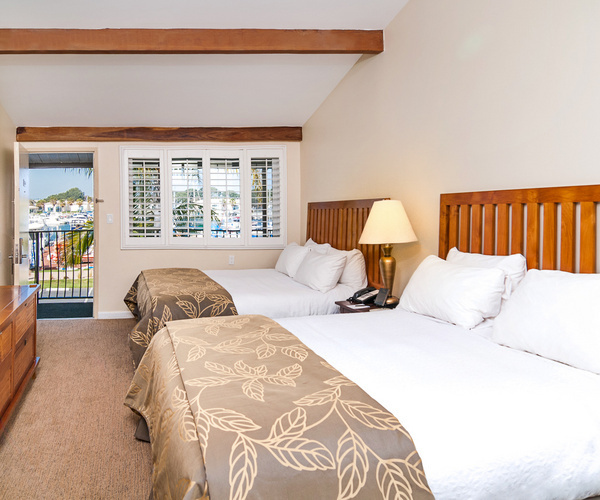 The Dana’s 271 rooms occupy two different areas of the resort, and include 12 suites. We stayed in a standard room which was on the small side, so larger families are advised to upgrade. Many rooms have balconies or patios that take advantage of the hotel’s waterfront location, but make sure you request one. Most have standard amenities such as safe, flat-screen TV, microwave and mini refrigerator. The beds were comfortable and the bedding fairly new, however the towels in our room looked a little worse for wear. The Dana has two onsite restaurants. The Blue Pearl is a family-style restaurant open for breakfast only. The food is reasonably priced for a sit down breakfast, delicious and cooked-to-order. The Firefly Restaurant and Bar is open for lunch and dinner and features a contemporary menu and cocktails. Both restaurants offer a children’s menu. The resort’s bayside pool serves food and drink year-round, while the tropical pool keeps seasonal hours. The coupon book guests receive at check-in offers discounts to all of these venues. We took advantage of the free kid’s meal coupon at breakfast, which brought our bill for two down to just under $15. With a 27 mile jogging trail at your doorstep, there’s no excuse not to get out there! Take advantage of Mission Bay’s clean sea air and stunning views while you enjoy the area’s healthy outdoor lifestyle. Whether you walk, jog or bike ride, start the day with an invigorating lap or two. If possible bring your kids’ bikes or scooters and save a few bucks from having to rent. Gwen Kleist is an award-winning writer and PR professional who works full-time at a major medical center in Southern California. 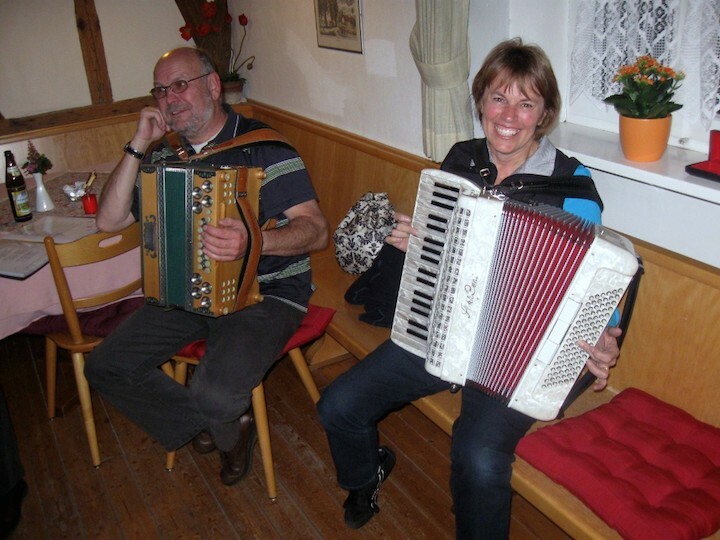 She is the mother of one very active son who shares her love of travel and adventure. 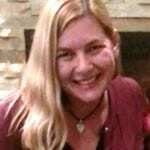 Her articles have appeared in San Diego Family Magazine, Sunset Magazine, Cat Fancy, Huntington Beach Magazine, and she was a contributing author to Explorer Publishing’s guidebook, Los Angeles: The Complete Resident’s Guide.